Or should I say, as the kids do, that “my book has just dropped”? 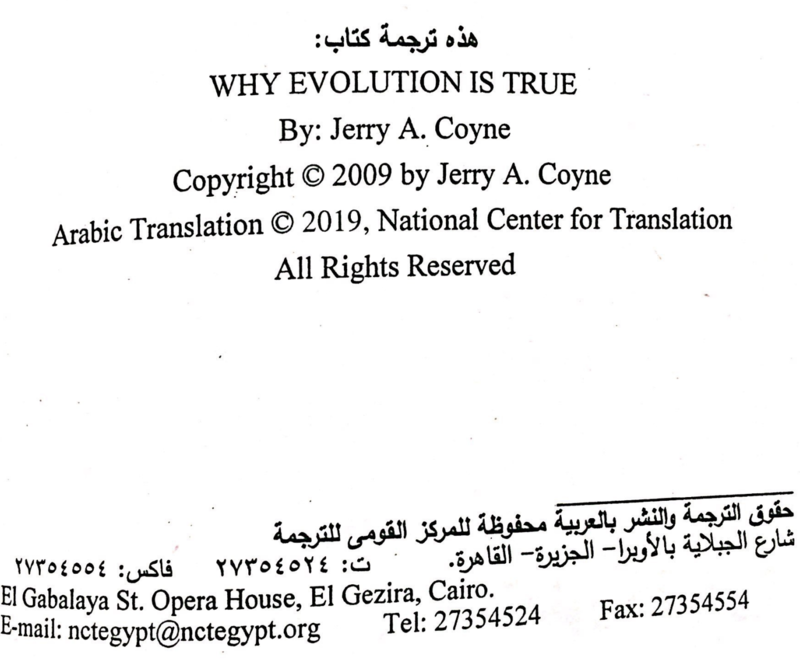 My Egyptian colleague, who saw the book through from inception until today, tells me that the Arabic edition of Why Evolution is True has now been printed, and next week will be on sale in a bookshop in Cairo, and perhaps in other venues. Rest assured that if there’s a way for Arabic-speakers to order or buy it, I’ll give you as much information as possible. There’s one possible contact at the bottom. I also got three pictures of the cover. 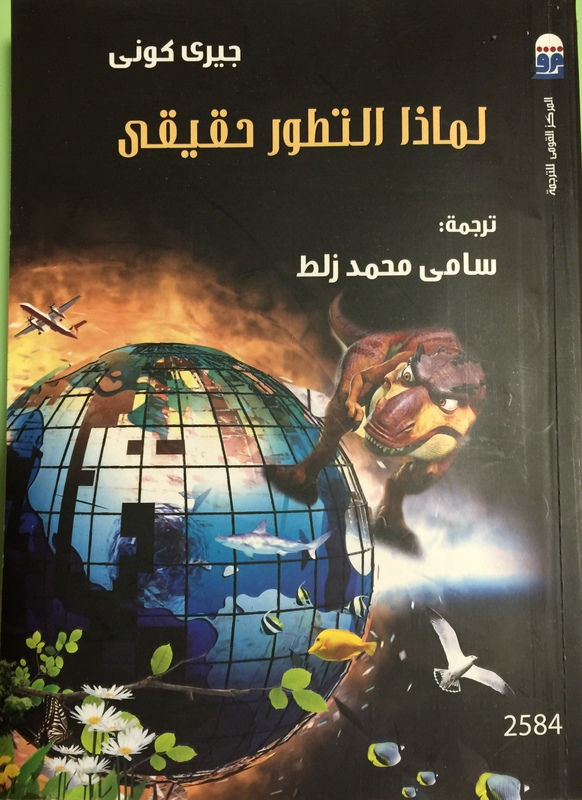 I can’t read them, of course, but Arabic-speaking readers might give us a translation of the cover. 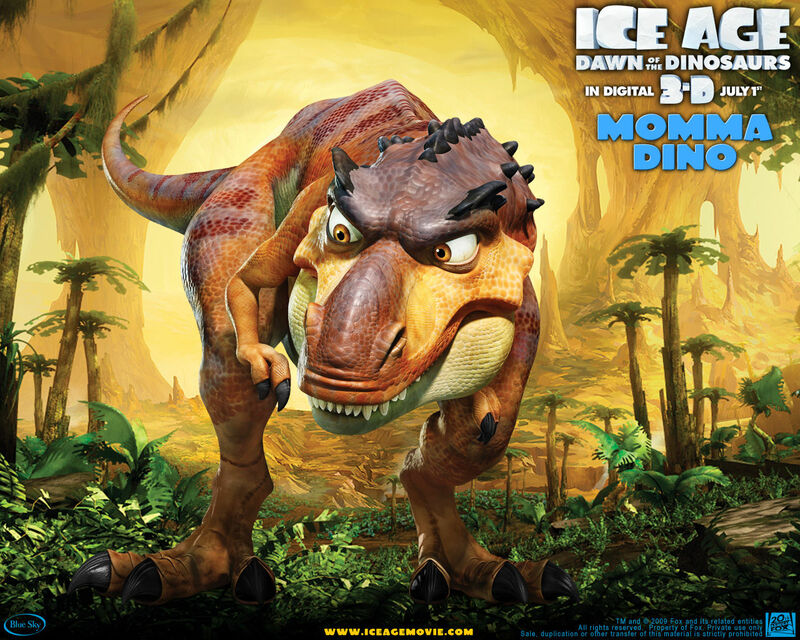 I have to say that the front image plenty weird: the T. rex looks like Groucho Marx! Here’s a scan of the title page giving one idea of where you can get it; I’m told the telephone prefix is 0020. Or you might email the address given below. This entry was written by whyevolutionistrue and posted on December 17, 2018 at 10:00 am and filed under books, self promotion, WEIT. Bookmark the permalink. Follow any comments here with the RSS feed for this post. Both comments and trackbacks are currently closed. Has a fatwa been declared yet? They’ve run out of flags to burn. Our bad. Looks a bit like the Tyrannosaur, from Ice Age – oh – it IS! OMG, I hope they got permission to use that image! Jerry, your book is so popular that it now has a tie-in with the Ice Age movie series. I wonder if the cover designer was a religious person trying to sabotage the book by featuring a fictional creature on the cover..
I’s be shocked — SHOCKED — if they got permission. Hahahaha. Oh, this is too funny. I’d expect this from the Chinese edition. Great! Do I smell a 3-D game version of WEIT? Or will Jerry end up imprisoned in a 20th Century Fox black site, undergoing daily re-education sessions led by a spittle spraying Kent Hovind, pacing back and forth in front of a gibberish covered blackboard, repeatedly slapping a riding crop into a leather-gloved palm….? I’m thinking Lin-Manuel Miranda might wanna make a musical out of it. The angry dinosaur is pretty funny. On second thought, I think I’m almost surely wrong in reading the bottom line (which appears to be the translator’s name). They obviously didn’t know how to pronounce PCC(E)s surname and turned him into a coney (rabbit), which ain’t bad. I think it should be more like كوين. As for his first name, Egyptian Arabic turns a “j” into a hard “g” so it is Gerry and not Jerry . I think (but I’m not sure) that the first letter in the translator’s surname is a mim. Whatever it is, it’s a mouthful of a name and I wouldn’t know how to pronounce it. But if PCC(E) has a colleague who was shepherding the book through the translation and publication process, I presume that he knows how to pronounce “Jerry Coyne” so I guess that’s the way his name is going to be spelled in (Egyptian) Arabic. But I wonder if what you translated as a “ya” at the end of كونى could be an alif maqsura? Even if it is, it still wouldn’t approximate the pronunciation of “Coyne.” But I like Gerry Coney. It’s Samy Zalat, who shepherded this book through the process but I forgot that he also translated it!!! Oy, am I red-faced! The translator’s name is Sami Mohammed Zalat. The third part of the name has the consonants Z, L and T. The short vowels are not shown in the Arabic, so it is not possible (for me, who is not that familiar with Egyptian names) to say which of the three possibilities they are. The “oy” sound in Coyne can only be approximated in the Arabic transliteration, and a long O sound has been used. I wish there would be a German edition, too. Earlier this year I had a dicussion with a co-irker about evolution. His stance was basically: ‘I don’t understand evolution so it can’t be true.’ It would have been nice to hand him this book. OK, the typo “co-irker” should immediately be put into popular usage. That was a typo? It’s brilliant, I have many co-irkers. No… not a typo, some of my coworkers are co-irkers. Yes — Richard Dawkins’ books get translated and are popular so there would definitely be a market for WEIT as well. Anyway, congratulations, and I hope it will be very successful and require many subsequent editions. May it spread far and wide. Very cool!! 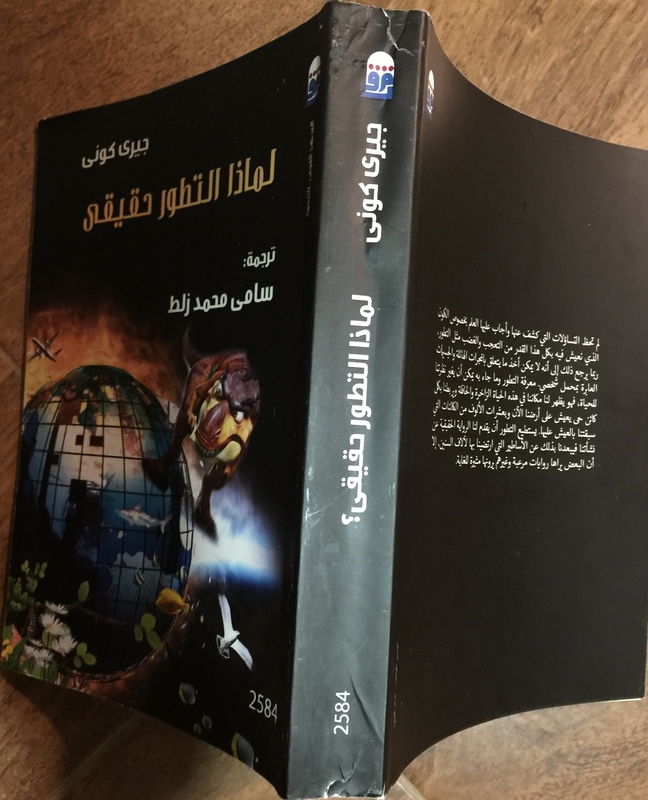 Since I am just now getting some of my books into other languages, how is it you pay for the translation? I’m going to guess the airplane symbolizes the Alaska Airlines employee who stole a plane for a joyride above Seattle, subsequently removing himself from the gene pool. I’m just glad they didn’t put the twin towers in the picture. Say the secret woid, the dinosaur drops down and you win a hundred dollars. Might wanna take your Egyptian royalties in bitcoin, boss. Great news. We could do with some! I was wondering about that plane as well…perhaps a symbol of human achievement that couldn’t have occurred without evolution? Then there’s the yellow tang, a seagull, a shark and a cartoon dino…very odd and random. This was supposed to be in response to Anthony above, #13. Congratulations! May your book contribute to the advancement of science in that part of the world. In its golden age, the Islamic world was a center of science and math. May it be once more. Hope the book sells well as it deserves to do. Congratulations Jerry! It’s so cool to see WEIT going into other languages.